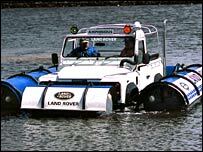 A Land Rover adapted to float on water is to be driven the length of the Caledonian Canal in the Highlands. The amphibious Defender 90 was a museum exhibit but has been fully restored for the three-day trip, which is due to begin on Tuesday. Land Rover World magazine and Land Rover UK staff will drive it on the canal and lochs Lochy, Oich and Ness. The vehicle was built in 1988 as part of Land Rover's sponsorship of the Cowes week yachting festival. Following amphibious service in the Solent, the Land Rover was retired to the Heritage Motor Centre in Gaydon, Warwickshire. John Carroll, Land Rover World editor, said: "I am really looking forward to seeing the fully restored amphibious Land Rover afloat and under its own power in such a beautiful setting." The Caledonian Canal stretches 60 miles along the Great Glen.